Pergolas vs. Gazebos — What’s Right for Me? 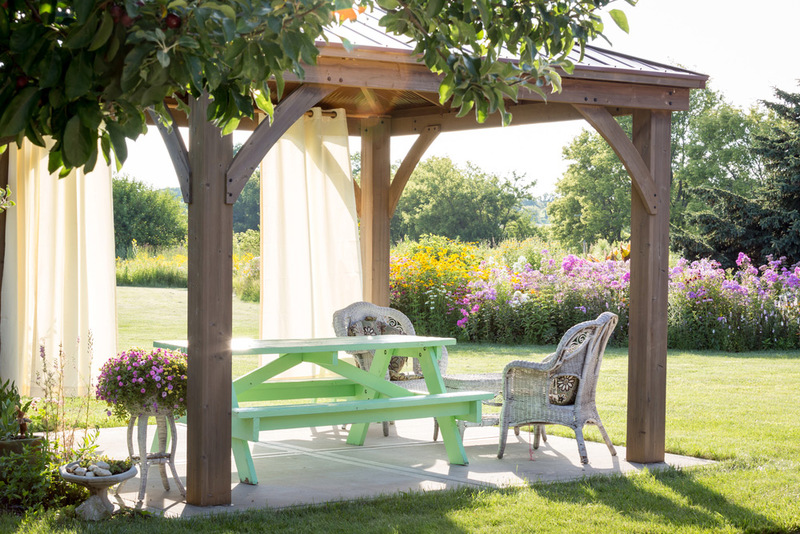 Are you stuck choosing between a pergola and gazebo for your backyard? These two popular exterior structures are often the most contemplated options when it comes to improving the yard space. And while they may be similar in certain ways, they differ slightly in function and style. To determine what’s right for your backyard, we’ll show you how these two choices differentiate in shape, style, cost and function so that you can find the right structure for your lifestyle and needs. Pergolas are described as an open structure since they do not have a solid top or floor and have open sides in the design. In most cases, they come in a square or rectangular shape and often contain a latticework structure that is commonly used to cover the pergola with flowers, vines, or drapes. A gazebo, on the other hand, is an enclosed structure that is often round, hexagonal or octagonal in design and features a roof accompanied by open sides and inside seating. When comparing pergolas vs gazebos, style is what truly distinguishes these two structures. To explain further, a gazebo has a solid roof that creates a freestanding structure that is designed to provide shelter and a place to rest. Due to its design, there are hundreds of different styles and types to choose from to create the gazebo that suits your needs best. Alternatively, pergolas are used primarily to create beautiful “retreat” areas or walkways and are often include simple designs. Since pergolas are generally open and exposed, they do not provide adequate protection from the elements unless you add draping or a tarp. In most cases, you can decorate the pergola with flowers, vines, and accessories to add some shade and protection from the sun. In contrast, gazebos provide a solid structure that yields modest protection from the rain and sun so you can relax and enjoy it even when the weather is not favourable. Both can be used as space for entertaining, but only a pergola will allow you to create separate areas in your outdoor space or on your deck and patio. When comparing the two, a gazebo will generally cost you more to build because it includes a solid roof and floor, along with seating and rails, which requires more materials and labour. However, if you plan to create an elaborate and detailed pergola, the cost may exceed a basic gazebo. If you’re still not sure what’s best for your exterior space when it comes to pergolas vs gazebos, allow us help! At Fence Masters, we’ll provide the advice that you need to figure out which is better suited to your space and lifestyle. We’ll also help you pick the best materials and design to accent your outdoor living space. To receive a free quote, contact us today, and we’ll help you get started!